Stately and sculptural, the madrona is one of the most dramatic and beautiful of Oregon’s native trees. 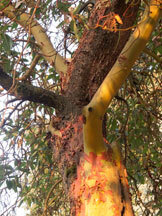 Its reddish bark gradually peels away, revealing the beautiful copper or orange-red color and silky smooth bark beneath. 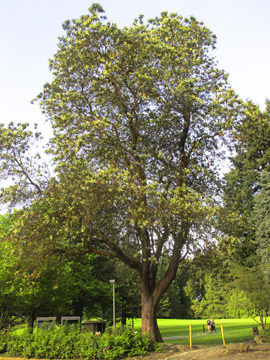 Typically found growing on rocky outcrops and dry bluffs, the Madrona is an unexpected addition to Pier Park. Several madronas grace the west side of the park. You will find their branches winding upward through the trees, reaching towards the sun. Pacific madrona is a broadleaved evergreen tree and a member of the heath family (Ericaceae). In addition to its smooth trunk and deciduous bark, it blooms in the spring with white panicles of fragrant flowers, followed by clusters of small round fruits that turn red in fall. These fruits are important food for many bird species as well as raccoons and deer. Pacific madronas attain heights of 80 to 125 ft and diameters of 24 to 48 in. The largest trees may be as much as 400 years old. Ages of 200 to 250 years have been counted. 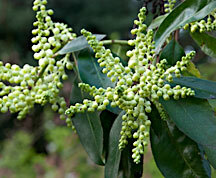 The native Americans considered the madrona to be sacred. Thus, the wood was never used for fire, even though it will burn long and hot. However, the berries were enjoyed and the leaves and bark were used medicinally to help cure cramps, stomach aches, sore throats and skin sores.